We have compiled a list of resources that we believe will be helpful in your bus buying journey. Our bus buying blog is full of articles regarding everything from popular bus options to current trends in the bus industry. By putting all of our resources in one location, the hope is that you will have all you need at your fingertips allowing you to make the best choice. We are also happy to provide helpful information on financing options. Our full color bus brochures are available for download and for sharing with friends. Check out several of the different flooring options that are available on buses as well as the vast choices of bus seating. If you are looking for technical documentation, we have compiled a list of useful resources you might be able to use. Please feel free to browse those here. 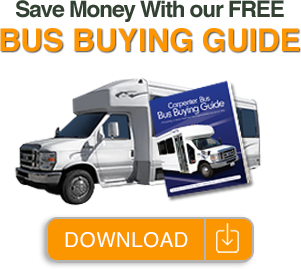 We have created a guide designed to help you in the bus purchase process. By downloading our Bus Buying Guide, you will get access to full color bus brochures, full HD videos, bus floor plans and BELOW PUBLISHED PRICES! Make sure you have all of the information you need to make the best possible decision for your organization. Our Bus Buying Guide will help you do that!